When hope drains into the sands. Paul Tritschler follows the downward spiral of irrational thinking, and finds inner resources for activists and social change. Imagine what we could achieve if we considered the oppression of others unthinkable – if it became a habit. At the queue to the Louvre a woman punched me in the lower back – she used her collapsed umbrella rather than her actual fist. ‘Move on!’ she spat viciously, apparently unaware that I had stopped shuffling forward because the sudden congestion rendered it impossible for me to do anything else. I said nothing, only glancing back briefly. It so happened the queue jerked into motion a moment later, instantly followed by an almost farcical kinetic wave – just like the duffle-coated queues that lined up in my old school yard – and she disappeared into the Mona Lisa mosh pit. Ten months earlier my gall bladder had been removed, but not my hypochondria; some minor pains and problems persisted and her thump did nothing to help. What was uppermost in my mind was lowermost in my stomach, and I had to sit down. The first available seat was in the centre of the Richelieu Room, filled with giant works of great art amidst the bulging and at times positively manic cameraphone-clicking paparazzi-crazed public. Sinking into the soft sofa, I reflected on what we think and feel when angry, and of how easy it is to fall into the trap of associating the aggressor’s behaviour with a variety of ‘types’ – potentially an endless list. Among centuries-old faces dredged up and fixed on canvas from the experience and imagination of artists – some depicting agony, others seemingly ecstatic – I examined my reactions: the thoughts that rushed to me at lightning speed in the moment of contact, and the emotions that were consequently stirred. The memories conjured were not random but selective – mainly bullying, experienced in the course of growing up, and one particularly violent episode lasting around a day. Once summoned they multiplied, prompted by the mental rehearsal of this ‘jolt’. I hadn’t quite forgiven my childhood tormentors, that was clear, but introspection also revealed I hadn’t quite forgiven myself. Part of the hatred for the cruelty of others was turned inward – simply a case of blaming the victim for being the victim. Our self-concept is a constantly evolving text that requires active interpretation – a process rather than a static entity, almost always in a state of flux. Behind the fronts we put up, it is an unstable image continually appearing and disappearing. The framed and frozen expressions set in oil on the walls around me were in some way a reminder of that: the confidence and certainty of social standing shown on the faces of those who owned vast stretches of the earth and the people who walked on it; the proud faces of those who readily drew swords to defend their honour or that of kings; the earnest expressions of those who brought down giants with slingshots. All were deteriorating in the cracks and in the patches of discolouration on the canvas, and despite the valiant efforts of an army of memory-restoration experts, their idea of self was disappearing on the path to historical oblivion. We die, in every sense, and no amount of paint can change that. If only in that process of deterioration our true self was revealed, but many of us go to our grave without ever realising our potential. The inscription on our headstone guarantees nothing of who we once were or what we might have become. Were you to look at some of the warriors or the lords and nobles on the wall in the wrong way when they were alive, let alone jolt them in the back with a stumpy umbrella, they would not have hesitated in having a knife put to your throat. Though to most minds a minor incident, even today the brolly action might be considered a major offence if the recipient were a police officer or a member of the royal family, and there would be many of lesser authority who would at the very least have taken a swipe back. But if they are at no further risk, what would they be defending if not their sense of self? And what does it mean if we do nothing: is it simply a quick risk assessment, or is it appeasement – some sort of acceptance? The problem is that the self is not a fixed sum or quantity; it does not occupy a place of certainty but an area that is continually negotiated. The common response of ‘Who do they think they are?’ is coded language for ‘What do they think of me?’ But at heart the question is ‘What do we think of ourselves?’. Victims commonly have a ‘Why me?’ moment, though some dwell on it longer than others. Was it something I did that could have been avoided? Is there something I should have said or done by way of defence? Is it something about me, am I so obviously a doormat to be trampled on? In those moments there is often the danger of a shift in self-belief – a shift psychologists refer to as a change in the locus of control. This involves the drift from a psychologically healthy state – an internal locus of control, characterised by the belief that we possess the ability to improve the quality of our life – to that of an external locus of control: a state where we feel our capacity to control the things that happen to us is at the mercy of external events and largely down to fate. Being the victim of a traumatic event may act as a trigger to becoming an external – i.e. of developing an external locus of control – but it is by no means a condition of it. Whatever the cause, the descent to an impoverished self-image is assisted simply by rehearsing negative events, however small, in self-implicating and ultimately irrational ways. It is an habitual state that, by necessity, falls outside the realm of rational explanation: externals are hooked on false ideas, self-blame and negative self-beliefs. They may be well concealed, but negative self-beliefs are associated with feelings of stress that chemically activate defensive mechanisms in the brain, and in turn they generalise (albeit distorted) thoughts to potentially threatening situations: failing a job interview, for example, may be attributed to ideas of inadequacy and lead individuals to remain ‘safely’ in the job they have – even when it is an isolating, hateful, abusive and bullying relationship. Needless to say, this scenario may extend to other relationships. These ideas consequently grow within the individual, but they also have a tendency to spread to others, to reinforce in them a sense of hopelessness at critical moments of low morale or times of crisis. The sense of powerlessness characteristic of externals, often accompanied by feelings of insecurity and loneliness, is infectious and can easily reach epidemic proportions. Comments on social media are often an indication of this trend. Many people repeatedly express their desire to permanently leave their country of origin because they hate the political party in power (and its leader), and frequently talk about requesting a change of passport through the citizenship of one of their parents or grandparents. Others, having resolved there is no way out for them, merely engage in a series of disparaging and ultimately banal remarks by whatever means available – often through twitter, Facebook or comments at the end of online newspaper articles. But more often than not they simply batten down the hatches. A similar pattern of passivity was evident in the UK and US during the Thatcher and Reagan years, where the majority of people witnessed rising profits alongside rising unemployment, poverty, wastelands, prisons, and the possibility of global destruction. With some notable exceptions, such as the campaign in the UK to kill the poll tax, the majority simply waited for the alternative party to come into power. Ironically, the ‘alternatives’ brought as much bloodshed and misery as their predecessors, and continued to pave the way for insatiable greed, financial collapse and austerity. Understandably, many feel helpless as individuals in the face of large corporations and privileged political elites; the latter, who dominate the media and define the political agenda, drain hope through glittering offers and broken promises, through misdirection and fear. However, whilst the feelings of helplessness against such odds may be understandable, they are nonetheless irrational, and typical of the thinking style of externals. Dominant interests, after all, act in groups and build alliances with like-minded class fractions to reinforce their power and spread their ideas – the morally deplorable notion, for example, that it is natural and acceptable for the accumulation of wealth to be mainly controlled and concentrated in the hands of a minority – and the irony is that the irrational ideas of externals allow them to flourish. Faced with the daunting task of effecting social change, an individual acting alone would of course feel powerless; the question is why the individual would not choose to build strength and sense of purpose and positive feelings of self-worth by becoming part of something greater – a movement striving to make the sorts of social changes they themselves would like to see. Tony Benn once remarked that ninety per cent of political victory is down to morale, and in this he was alluding to the fact that political defeat often feels acutely personal – he might have said that in such moments we are at risk of drifting towards an external locus of control. This sense of defeat is familiar territory for externals, and forms part of their self-fulfilling prophecy: ‘Just my luck to have been born into a damaged country!’ People in this mindset find the option of joining a common struggle to reclaim and change their environment less attractive than the option – real or imagined – of escaping to ‘sunnier climes’. Further along that road lies the desire to escape the world, or life itself. Some indication of this kind of thinking is reflected in the embarrassment expressed online and elsewhere about ‘the government’ and its policies, and in the apologetic tones to countries perceived as progressive. This ‘What must they think of us?’ scenario can be interpreted as an indication of a diminishing sense of self-worth – somewhat akin to apologising to the neighbours for the mess made by invaders who trashed the joint, or of blaming themselves for their own abuse, past or present. Internals, on the other hand, see change as something that is within their control; they might, for example, rail against unjust government policies and laws, campaign against corporations that move in and desolate whole communities, mobilise participatory collective action, foster progressive alliances, and stand firm in their support of social movements and oppressed minority groups – locally and globally. It was the internal who told us another world is possible, who urged us to take the first step even if we couldn’t see the whole staircase, who told us that courage was not the absence of fear but the conquering of that fear, and who said that we had nothing to lose but our chains. The contrast here is not with petty self-indulgences and self-pitying moods (albeit that these too are habitual), but with the downward spiral of irrational thinking. The latter is a particular way of looking at the world and one’s place in it that is ultimately crippling for the individual; but it is important to realise that it is also a ‘way of seeing’ that can change – a way that can be challenged by logic, by confronting evidence, and by forging alliances. The development of an internal locus of control is one possible antidote, and internals – as potential role models – can form part of this process. Internals possess the power to demand changes that increase the welfare and wellbeing of all, and the bonus is that this too is an habitual state, one that anyone can learn: simply follow what is good – and get involved. Habit, in the words of Thomas à Kempis, is overcome by habit. What links us as human beings, above all, is the search – conscious or otherwise – for meaning and purpose in life: a quest that flourishes within a social context, and in so doing helps develop a balanced sense of self. Psychologists have long realised that developing and reinforcing strong social bonds provides structure and meaning to our life, as demonstrated by those who have gained greater resilience and personal growth – one might say greater self-realisation – through adversity. The journey is a process of becoming, and there is no end state. It is not in our nature to be good or evil, but to be social, and it is within this context that we may find unfathomable resources of strength. Back in the Louvre hung the images of disdainful kings, queens and aristocrats, of tyrants, tormentors, torturers, usurpers, cheats and exploiters, of spoiled adults allowed to indulge their fantasies, and children their cruelties. All around I saw obscene levels of wealth and power concentrated through the ages in the hands of a minority – as indeed the forces that exert a determining influence on the nature of our lives today are a small minority. I couldn’t leave until I had cast my gaze upon a painting that displayed our better side – one that would help me to forgive the woman with the brolly, and to forgive myself for being its recipient. 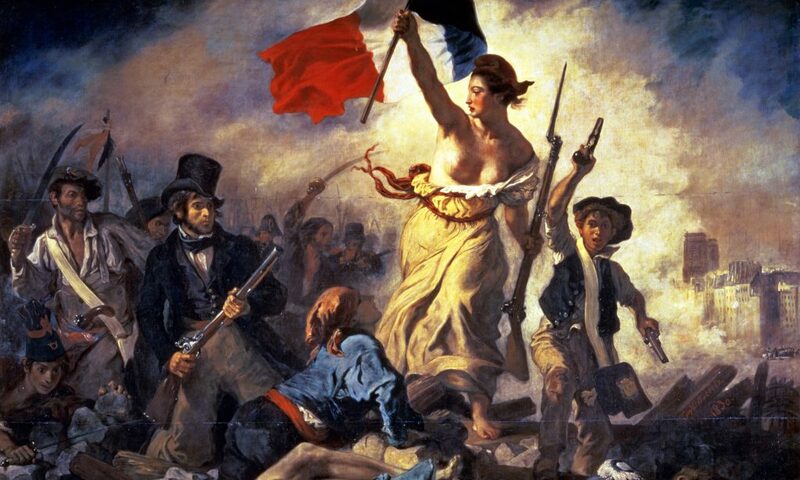 I wandered around the world’s greatest gallery, I wandered for hours, and whilst there were many contenders that lifted my spirits, I found it in Room 77 of the Denon Wing: Delacroix’s allegorical image of ‘Liberty Leading the People’ – a passionate evocation of popular sovereignty. What a marvellous thing it is to be human when you realise what you are able to achieve. Wonderfully well written, thoughtful article. Thank you. A brilliant ,thought provoking and timely piece. I will no doubt need to return to this many times over the coming weeks and months. A keeper. Thank you.